You must be 21 years or older to join our wine club or to purchase wine with us. Wine club releases occur in Winter (March), Spring (May) & Fall (October), or Winter (March) & Fall (October)* depending on enrolled Wine Club Level. *Mineral Springs and North Valley Vineyards Wine Club Members will receive shipments in Winter & Fall. 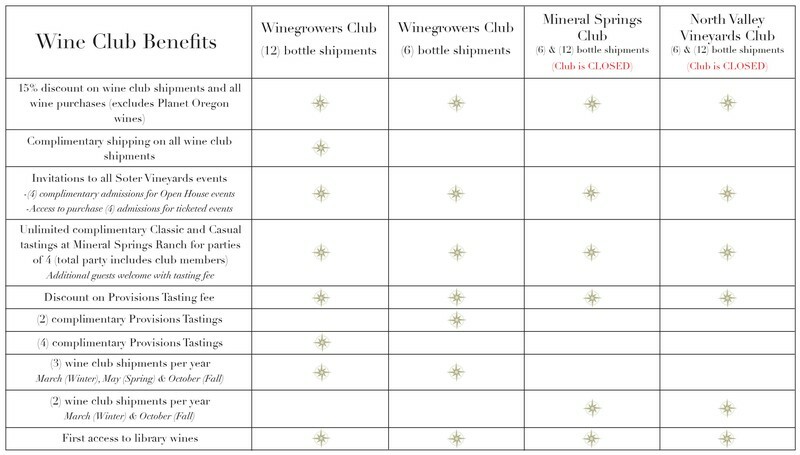 If you are currently enrolled in either the Mineral Springs or North Valley Wine Clubs, you are grandfathered in. These club levels have reached capacity and are no longer accepting new Members. Once you have cancelled membership to either of these club levels, you will no longer be able to re-join them. The Winegrowers Club Membership is open and accepting new Club Members. Wines included in shipments are subject to change due to availability. The primary credit card on file will be charged at least one (1) week before the wine is shipped or picked up. Soter Vineyards requests a one (1) year minimum commitment to the Wine Club. Membership is on-going and may be cancelled after receiving your full year of shipments. Cancellations can be submitted via email to our Wine Club Manager: meg@sotervineyards.com, in writing to: PO Box 430 Carlton, OR 97111, or by calling our office at 503-662-5600. If cancelling membership prior to receiving your full year of shipments, a $75 cancellation fee will be charged to the primary card on file. Members are allowed one (1) skipped shipment per the lifetime of the membership. Requests to skip a shipment or cancel membership must be received two (2) weeks prior to the season’s wine club processing date. Cancellations of shipments or memberships cannot be honored during the wine club processing period. Wine Club Members are admitted a total party of four (4), including Club Members to invitation only events throughout the year. Shipments are shipped via FedEx. We can ship via UPS upon request. Please see our shipping policy for more details. An adult signature is required upon delivery of all wine shipments. We recommend shipping to a business address if no one 21 years or older will be home to sign for the package during the day. Members are responsible for any state taxes that may apply to the purchase and/or shipment of any wines. Members are responsible for all shipping charges including those incurred due to misdirected and/or returned shipments. Please note it is the Wine Club Members’ obligation to notify Soter Vineyards of any account changes (billing/shipping address, phone, email or payment information) two (2) weeks prior to the shipping or pick-up of the wine club shipment. In order to ensure that our Wine Club Members always receive first access to our wines and receive the best pricing possible, we are unable to extend member benefits or member pricing to non-members. For our “pick-up” Wine Club Members: We ask that you please pick-up your wine within six (6) months of its release. Soter Vineyards is unable to hold your wine shipments past this time. If after six (6) months, you have not picked-up your wine or made other arrangements with us to receive your wine, we will consider your wine abandoned and it will be returned to inventory. We are unable to process any returns/exchanges after 180 days. Please contact us at 503-662-5600 if you need to make other arrangements.